Great covers come from a myriad of sources. But the coverlover’s collection is founded on a finite set, where coverage runs fast and free: deep wells that sustain us, pouring forth the volumes that pepper our mixtapes and shore up our artist-centric features, from “homage houses” like Reimagine Music and American Laundromat Records to ongoing YouTube tour-stops like AV Undercover and the pop-up microstudios of Dutch field recorder Onder Invloed. Back To The Source, our newest feature concept, dives deep into these wells, seeking to celebrate and reveal just what makes their waters so prolific and life-sustaining. 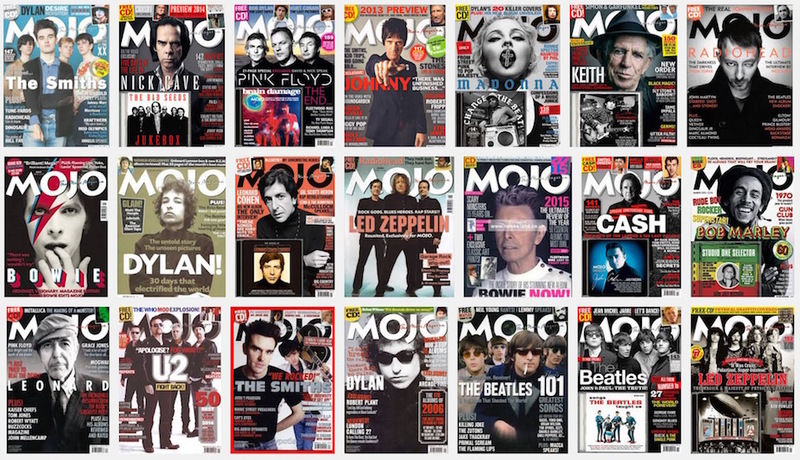 We kick things off today with a look at MOJO, who in just over a decade has produced dozens of tributes to seminal albums and artists, sealed lovingly in plastic alongside their monthly music magazine; read on for beautiful interpretations of seminal songs from Pink Floyd, Bob Dylan, Leonard Cohen, Fleetwood Mac, The Rolling Stones, and more, plus more Beatles covers than you could ever imagine. I love used CD stores, where a quick skim of the liner notes can reveal treasures previously unnoticed or unheard, and rarities abound, from live local radio compilations to label tributes long out of print. And so, a few weekends ago, in a last gasp effort to enjoy the waning days of summer, we found ourselves in Brattleboro, VT, where Turn It Up records has recently relocated to new digs. I begged a few minutes from the end of a great meal, and headed for the stacks. And there, in the three for five bucks tray, was a treasure trove: someone’s entire collection of Mojo Records CDs. It was an incomplete set, to be sure – about 5 year’s worth, of a total collection that so far spans a dozen. But I walked away with ten separate tribute albums, most otherwise impossible to find. And after steeping in them for two weeks, it was just too good not to share. A little history here: Mojo Magazine has included a free CD with almost every issue since late 2004; not all tackle covers, but many do. Two-disc set Beatlemania, which emerged in September of that year, and Cash Covered, released that November, were the first covers compilations to appear as part of a series that yaws wide enough to define the broad tastes of Mojo itself, where punk, soul, pop and indie all have their place in the pantheon, and authenticity is the name of the game. For the first few years, Mojo’s CDs tended to compile previously recorded material, maybe with a brand new track or two; the joy here was in the collection and organization, which generally trended towards a broad genre spectrum held together marvelously, resulting in a growing cache of eminently listenable long-plays. In more recent years, Mojo has included a number of bespoke CDs in their collection, with songs solicited and recorded exclusively for their projects. Either way, their taste is impeccable: it is these collections, in fact, which have introduced me to The Staves, Neville Skelly, Jeb Loy Nichols, and other up-and-comers, while renewing my love for Woodpigeon, Phosphorescent, Yim Yames, Sam Amidon, Emily Barker, Thea Gilmore, Jim White, and many more artists pushing the envelope beyond easy genre categorization. In the end, as a collection, the Mojo tribute CDs stand almost unparalleled – a fitting beginning for a new feature series, and a great way to celebrate the magazine and its tastemakers as they continue their search for the source in the songscape. Read on for our favorite, folkiest tracks from a close-to-complete chronology of cover albums, from that Beatlemania set to Blonde on Blonde Revisited, last month’s delight of a Dylan tribute. Always artist-friendly and ad-free, Cover Lay Down has been covering the changing landscape of music since 2007 thanks to the continued efforts of sources like Mojo…and the kindness of readers like you. Donate today to help us keep the servers spinning, and receive our undying thanks, PLUS a mixtape of otherwise unblogged rarities!